actively promoting the medium's acceptance through teaching and lecturing. His book on serigraphy, "Artists Manual for Silk Screen Printmaking" has gone through many printings. During his career, he has been included in numerous national group exhibitions and has had over fifty one-man shows in various parts of the country. His serigraphs are held in the permanent collections of the Metropolitan Museum of Art, the Philadelphia Museum, the Syracuse Museum, the Carnegie Institute and the Princeton Print Club. from New York City WPA Art, NYC WPA Artists Inc, New York, 1977. 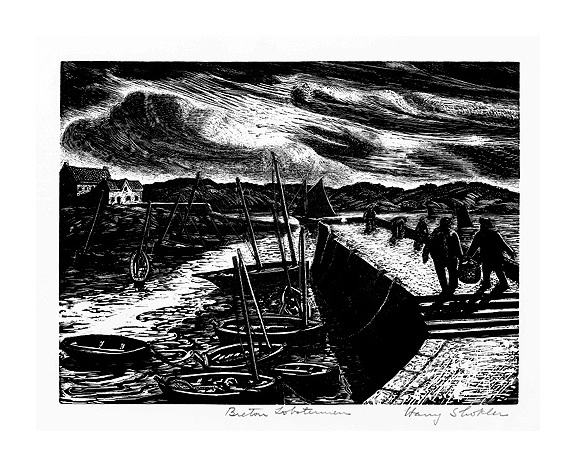 Lobster Fishers (Breton Lobstermen) =1c.1937, Wood Engraving. Image size 6 x 8 1/16 inches (152 x 206 mm); sheet size 8 7/8 x 11 inches (225 x 279 mm). A fine, black impression with full margins (1 1/8 to 1 5/8 inches) on cream wove paper, in excellent condition.